UK Nyckelharpa Project | Nyckelharpa! The nyckelharpa is the most ethereal of instruments, nearly lost to the world but kept safe in a small region of Sweden. This wonderful instrument is now coming to a town near you! The UK nyckelharpa project's aim is to take nyckelharpas around the country and conduct workshops introducing as many people to this wonderful instrument as possible. If you've seen a nyckelharpa and would like a go, these workshops are for you. Workshops are kept to small numbers and instruments are provided. Read the article - Nyckelharpa-Esta from the European String Teachers Association Magazine. In the tab above you'll find NH4aD - this is short for Nyckalharpa Four a Day. This is Vicki's teaching materials to help beginners with no local teacher as they start on their nyckelharpa journey. Go and take a look! It's always under development as good teaching materials should always evolve and change to the needs of the student. 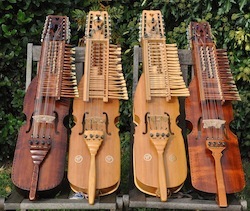 06-08.09.19 - Halsway Manor Full Nyckelharpa Festival Weekend - BOOK NOW, SPACES GOING FAST! Check the map to see when we are near you to book a 'have a go' lesson.